Со смягчением ограничений, наложенных на германскую авиапромышленность, у компании "Junkers" появилась возможность разработать и построить большой транспортный самолет. Созданный G 31 коммерческого успеха не имел, но он стал первым пассажирским самолетом, ДальшеMore>>> на борту которого появился стюард. Трехмоторную схему самолета конструкторы выбрали, чтобы обойти ограничения, установленные союзниками, однако она была предпочтительнее одномоторной и с точки зрения безопасности полетов. Большие размеры самолета отражали тенденцию роста авиаперевозок в Европе. Под общим руководством Эрнста Цинделя полномасштабное проектирование вел инженер Хоффман. G 31 проектировался как моноплан пассажировместимостью 15 человек. В салоне предусмотрели наличие туалета и отдельных купе-отсеков, наклон спинок кресел регулировался. Прототип выполнил первый полет 7 сентября 1926 года с тремя моторами Junkers L2, средний мотор позже заменили на BMW VI. 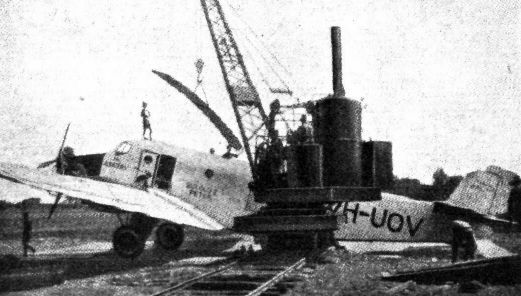 В 1926-1931 годах построили восемь самолетов для компании "Deutsche Lufthansa": три G 31a с моторами Gnome-Rhone Jupiter VI и двухкилевым оперением и три G 31fi с увеличенными фюзеляжем и крылом и тремя моторами Siemens Jupiter. В 1931-1932 годах построили первые G 31fo с моторами BMW Hornet. На некоторых самолетах "Deutsche Lufthansa" оборудовали кухни для обеспечения пассажиров в полете горячей пищей. G 31 эксплуатировали до 1935 года, потом некоторые машины передали Люфтваффе, где их никогда не применяли на фронте. Четыре G 31 продали австралийской компании "Guinea Airways", эти самолеты обслуживали месторождения золота на Новой Гвинее. Одним из них был первый прототип, три других - вариант G 31 до с открытой кабиной экипажа и грузовым люком в днище фюзеляжа. Три самолета было уничтожено в 1942 году при авиационном налете, уцелевшая машина получила в австралийских ВВС регистрацию A44-1. В конце 1942 года эта машина получила повреждения, но в 1945 году ее отремонтировали, после чего некоторое время эксплуатировали. Силовая установка: три 9-цилиндровых звездообразных мотора Pratt & Whitney Hornet постройки компании "BMW" мощностью по 525 л. с. MUCH has been written and spoken recently of comfort in air travel, and various means have been suggested for giving to air passengers that comfort which they associate with railway travel and expect in aircraft. As the problem has not yet been solved (in any case, at the moment it takes the aircraft designer most of his time to produce a commercial machine, and he usually has little surplus weight left to devote to comfort), it is always of interest to follow the progress made in the same directions by others. Particulars have just reached us of the Junkers G.31 in what may perhaps be regarded as its service form, as distinct from the first experimental type, which was produced last autumn, when it was illustrated in FLIGHT. The G.31 is regarded by the Junkers firm as the logical development of the G.24, of which, in the main, it is an enlarged edition. It is intended for service over comparatively long routes, where night flying is to be developed as part of the regular schedule, and has consequently been planned, as regards its cabin arrangement, with the object in view of arranging for sleeping berths to be installed. 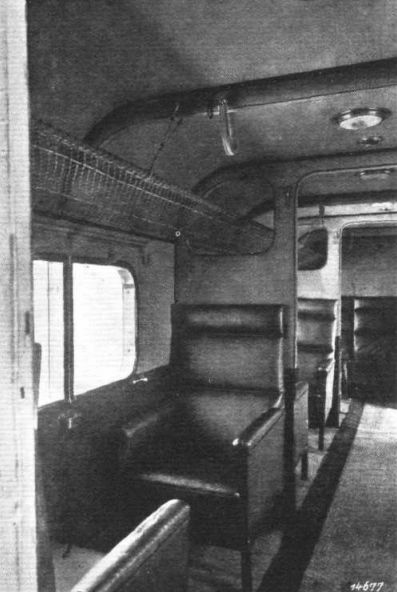 In order to render the machine suitable for both night and day travel, the available saloon space has been divided into three compartments. According to whether a compartment is required for day or night flying, it is equipped with armchairs or berths, the space being such that either two armchairs facing one another, or two berths, one above the other, can be installed. Our photographs illustrate this somewhat "mixed" arrangement, and when the photographs were taken the machine had not, apparently, reached the stage in its evolution where one compartment is labelled "Herren" and another "Damen." 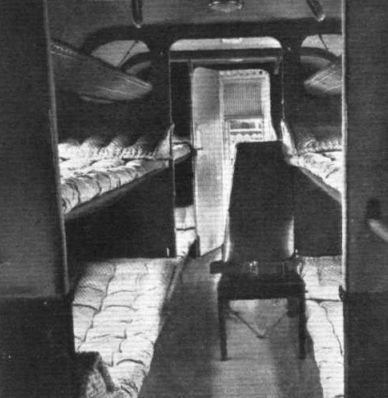 In the actual arrangement illustrated the forward compartment has two folding berths on one side, and two armchairs on the other. The middle compartment has four armchairs, while the last, in the wall of which is the entrance door, has one armchair and a sofa, seating two. 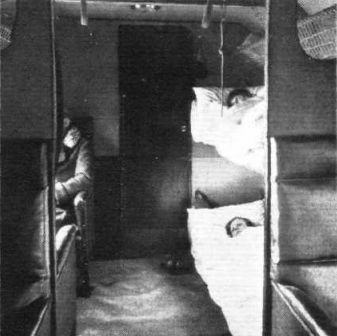 Between the pilots' cockpit and the front passengers' compartment is a large compartment for freight and luggage and, separated from this by a wall, the auxiliary engine room, in which is installed the engine that drives the electric generator and the compressor. The latter provides the pressure necessary for starting the engines and for maintaining pressure in the petrol system. 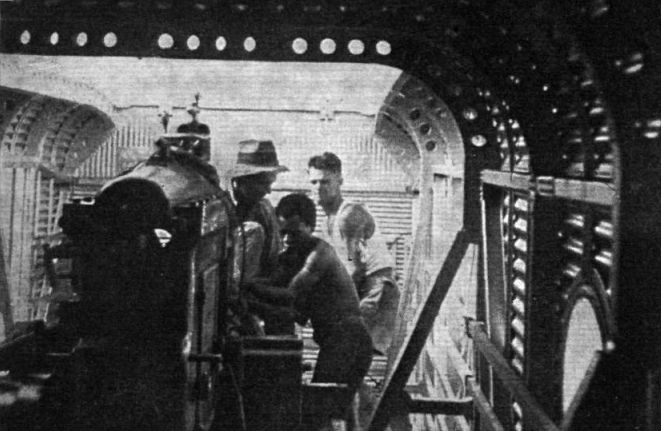 The generator supplies light to the compartments, cockpits, luggage hold, landing and navigation lights, etc., and power for the wireless outfit. Actually, this generator is normally in reserve, a windmill-driven generator supplying the electricity during flight. The petrol system (the main tanks are in the wings) is equally duplicated, there being two pumps, each of which is able to supply all three engines, and a hand pump besides. 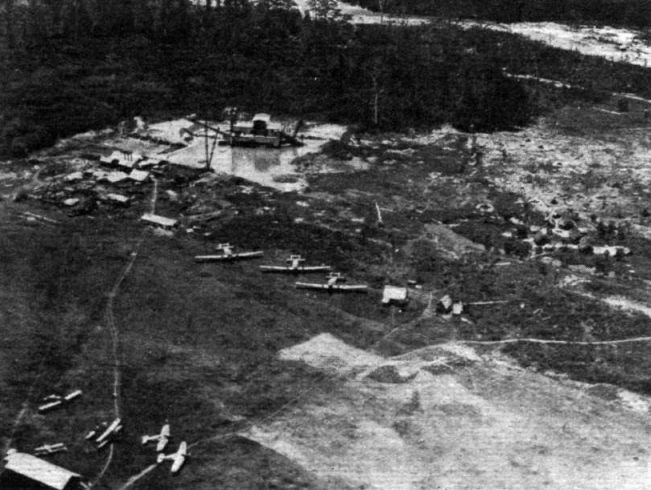 Doubtless all this makes for complication, but with the low-wing monoplane arrangement, direct gravity feed was probably out of the question. Below the floor of the saloon is a luggage hold for smaller articles, reached by a separate door, so that passengers are not inconvenienced by the luggage in any way. 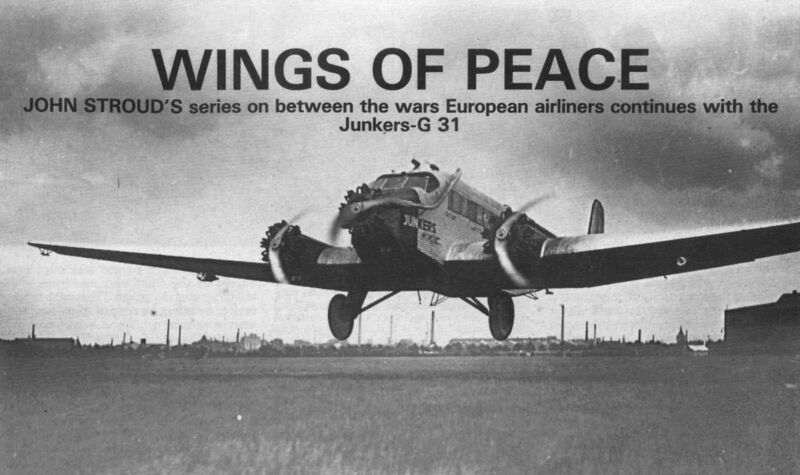 The main data relating to the Junkers G.31 commercial machine are :- Wing span, overall, 30-3 m. (99 ft. 4 ins. ); length, overall, 16-2 m. (53 ft. 2 ins. ); height, 6 m. (19 ft. 8 in. ); average saloon width more than 2 m. (about 6 ft. 9 in ) total engine power, 1,200 b.h.p. 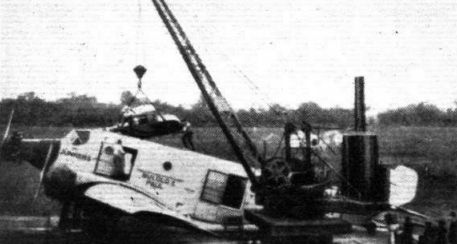 Total flying weight, 7-7 tons (metric) = 16,940 lbs. Range with normal tanks, 1,000 km. (620 miles), at a speed of 185 km./hrs. (115 m.p.h.). It is understood that a G. 31 will be fitted with Napier "Lions." 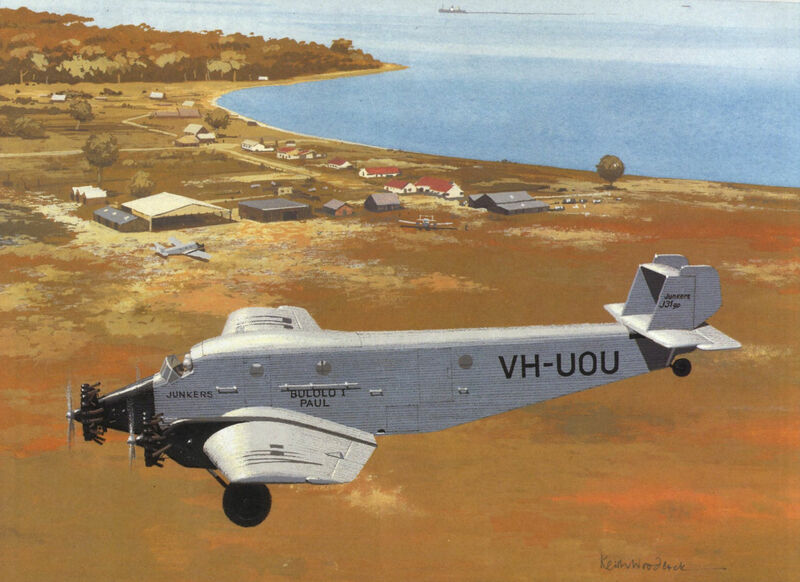 In our issue of last week we commented on the fact that the Junkers stand at the I.L.A. is separated from the rest of the stands of the German aircraft constructors by a high partition so as to hide it entirely from view when viewed from the main body of Hall I. The explanation for this is now found to be that Junkers is not a member of the Society of German Aircraft Constructors, and that thus the Junkers exhibit is to be regarded as one separate from the I.L.A., at which it was not originally Junkers' intention to exhibit at all. Whether the tall partition was dictated by a feeling of modesty or by one of superiority and aloofness we are naturally not in a position to say. To foreign visitors, the spectacle of a German aircraft constructor exhibiting in the German hall of the exhibition, but separated therefrom by a high wall is rather amusing, and would not easily find its counterpart in any other country. Germany may have turned democratic, but the spirit does not yet appear to have permeated the whole of the German aircraft industry. The Junkers' stand is one of surpassing interest, and the fact that almost any accredited visitor to the stand can fairly easily arrange for a visit to the works at Dessau proves that the firm does not believe in secrecy. In fact, it is probably this very hospitality which accounts in a large measure for the extent to which Junkers aircraft are known the world over to-day. One may not be an admirer of the forms of construction which Professor Junkers has developed. It is not very difficult to find fault with them on theoretical grounds, but like Fokker's welded steel-tube fuselage construction, the "proof of the pudding is in the eating." The machines do appear to stand up to their work, and with the mass-production plant which has been created at Dessau, the cost of the Junkers machines is relatively low. 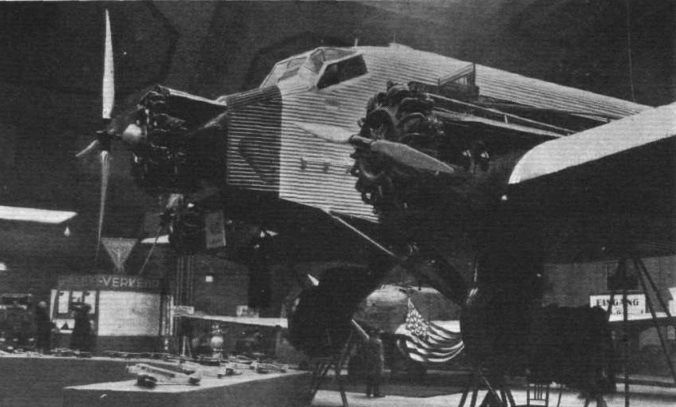 One might write at great length on the exhibits other than complete aircraft on the Junkers' stand, but the present section is intended to deal with large commercial aircraft only, and this narrows the subject down to the large G.31 three-engined machine shown in the centre of the stand, with two smaller types on either side. 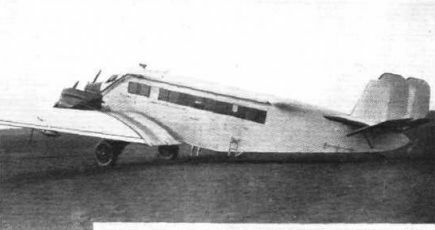 The Junkers type G.31 is not a new type, having been in regular use for some time not only on the internal German lines but also on the London route, so that visitors to Croydon aerodrome will already be familiar with the machine. The writer of these notes has not yet had the pleasure of travelling in the Junkers G.31, but he has spoken to quite a large number of air travellers who have made flights in this machine, and one and all are agreed that for sheer comfort the G.31 would be hard to beat. 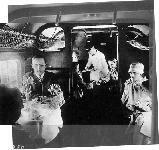 The rigidity of the multi-spar wing structure, and the padding of the cabin walls result in a saloon in which it is quite easy to carry out a conversation with a fellow passenger in a normal voice. 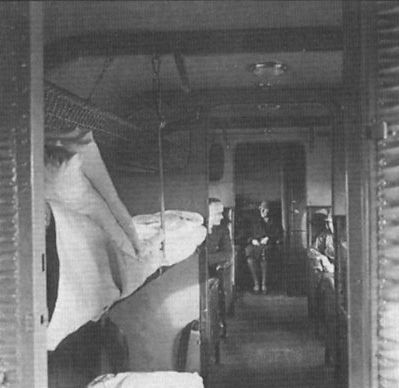 That the extra weight of the cabin equipment must of necessity increase the tare weight of the machine, and thus either result in a smaller pay load or a greater power loading must be admitted, and the G.31 represents in this respect a policy which departs rather notably from that adhered to by our own air line company, the directors of which have always placed greater importance on having a good power reserve than on giving the passengers a maximum of comfort. 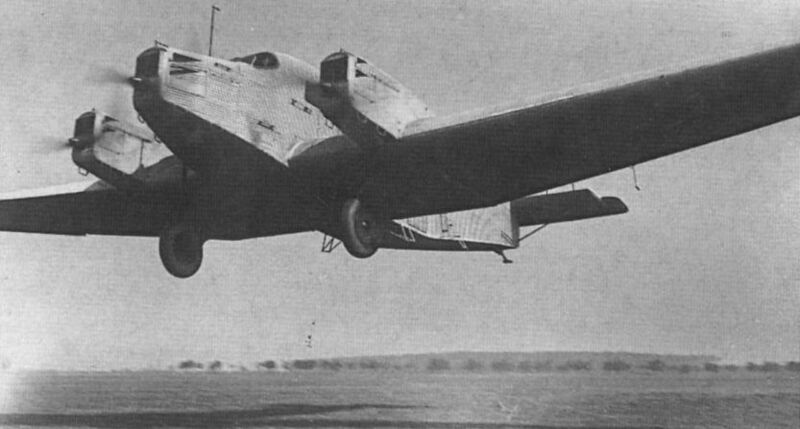 Constructionally the G.31 follows normal Junkers practice. The low monoplane wing is of the familiar multi-spar construction, with covering of corrugated Duralumin. The fuselage is covered with the same material, and has a internal structure partly tubular and partly of built-up channel section members. On the exhibition machine the central engine is of the geared type and drives a four-bladed airscrew, while the two wing engines are direct drive and fitted with two-bladed propellers. Reference has already been made to the comfortable cabin. 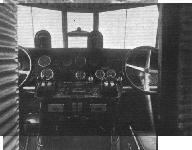 The cockpit also is exceptionally well appointed, and protected by large wind screens. One of our photographs shows a portion of the cockpit, from which the very excellent layout of the controls, instruments, &c, can be seen. 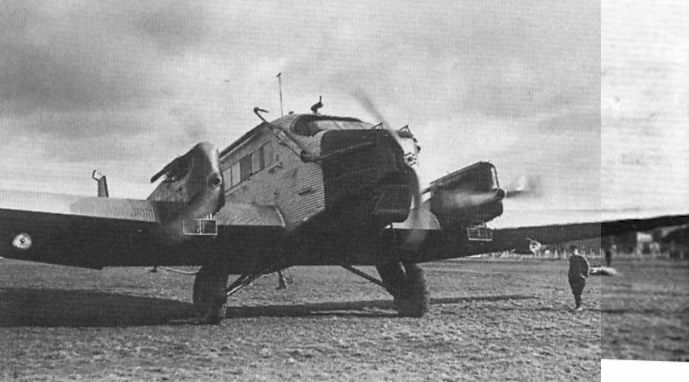 The main dimensions of the Junkers G.31 are: Length o.a., 16-2 m. (54-1 ft.). ; wing span, 30-5 m. (100 ft.); wing area, 94-5 sq. m. (1,015 sq. ft.); tare weight, 4,400 kg. (9,675 lbs. ); permissible load, 3,600 kg. (7,920 lbs. ); total loaded weight, 8,000 kg. (17,595 lbs.). Maximum speed, 205 km./h. (127 m.p.h.). 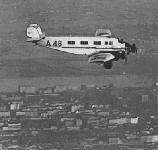 The Junkers G.31 has three "Jupiter" engines, of which the central engine is fitted with a four-bladed propeller. This engine is geared, while the wing engines are direct-drive types. 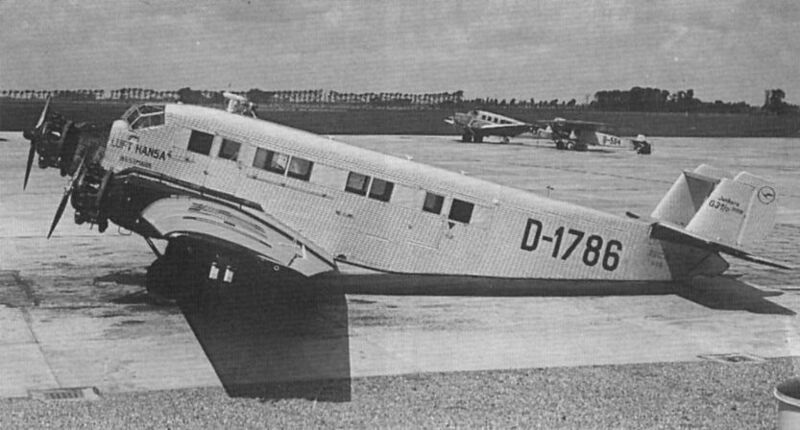 THE ZURICH MEETING: Three-quarter front view of the "Jupiter"-engined Junkers which won the Circuit of the Alps for commercial aeroplanes. 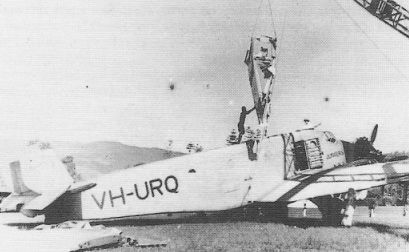 The G.31 prototype, VH-URQ, showing the fuselage of a W.34 (possibly VH-UJD) being lifted through the fuselage hatch. Loading a section of gold mining dredge into VH-UOU. Note that the type is shown on the fin as a J.31go, while the designation G.31 appeared on the others. Bovine airmindedness: Unloading a bull and a cow from one of the G.31S at Wau aerodrome. The advantages of low-wing all-metal construction are made quite obvious. 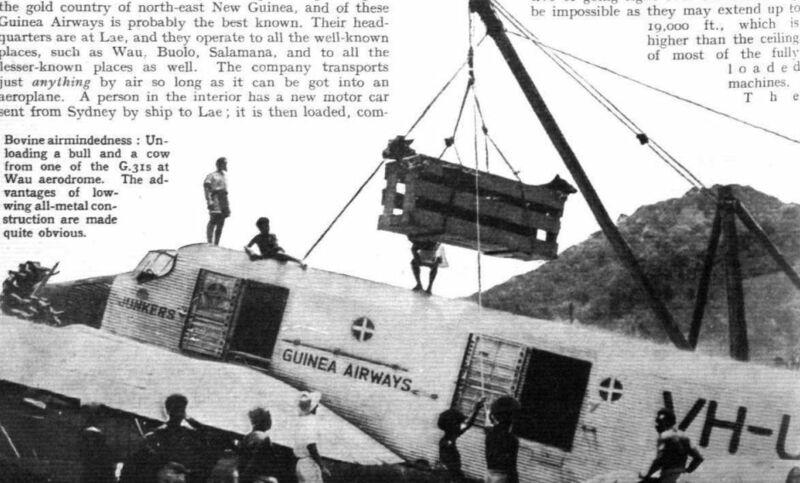 IN NEW GUINEA: One of the Junkers G.31 heavy freight monoplanes (three "Hornets") used by Guinea Airways, Ltd., for transporting mining machinery, etc., to the Bulolo goldfields. 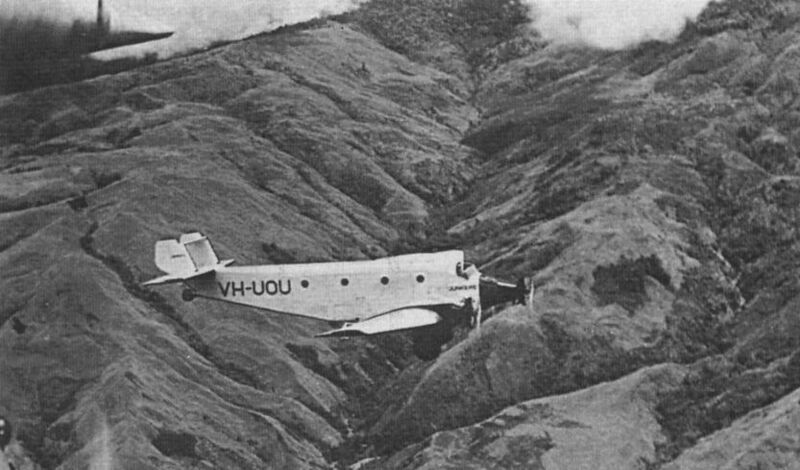 A Morris-Cowley being transported by a Junkers G.31 to the gold fields in New Guinea. 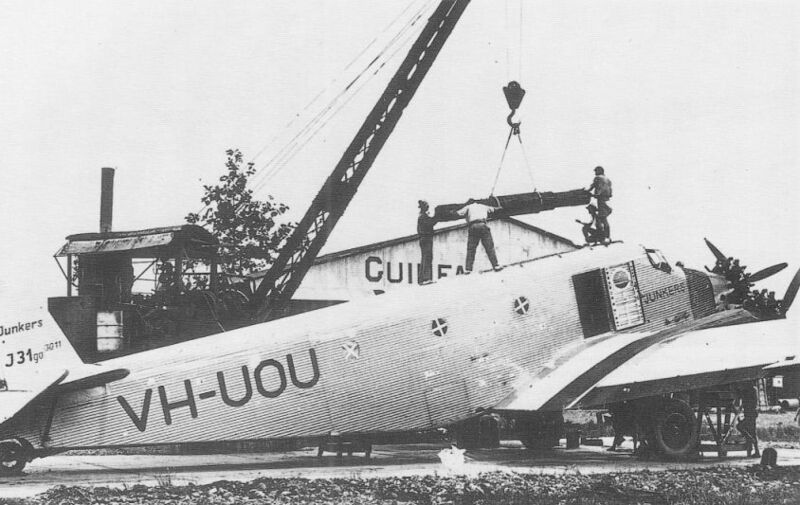 G.31 VH-UOW of Guinea Airways. 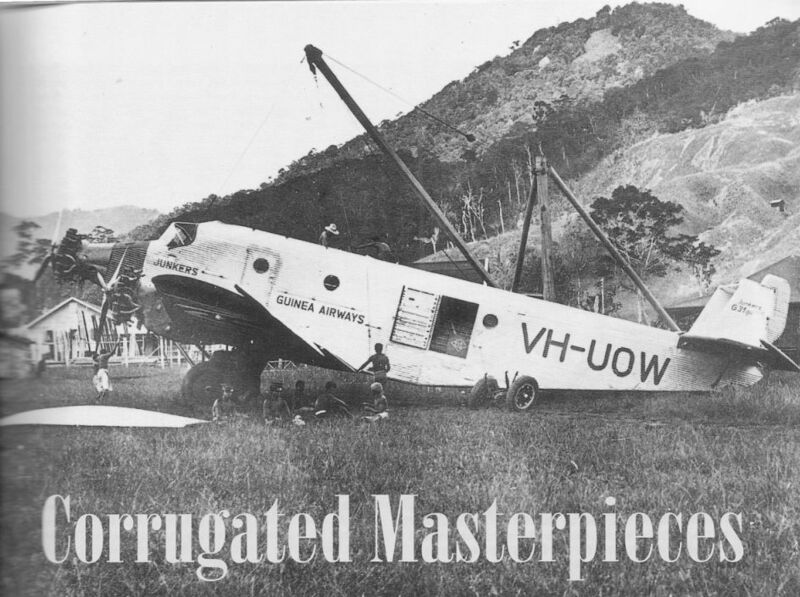 The top fuselage hatch is lying alongside the aircraft. One of the four Gold Dreggers erected by the Bulolo Gold Dredging Co., New Guinea. 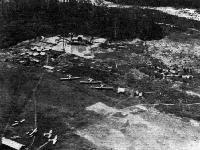 Three of the Junkers G-31 monoplanes (Pratt & Whitney "Hornets") which carried in sections up from the coast are in foreground. 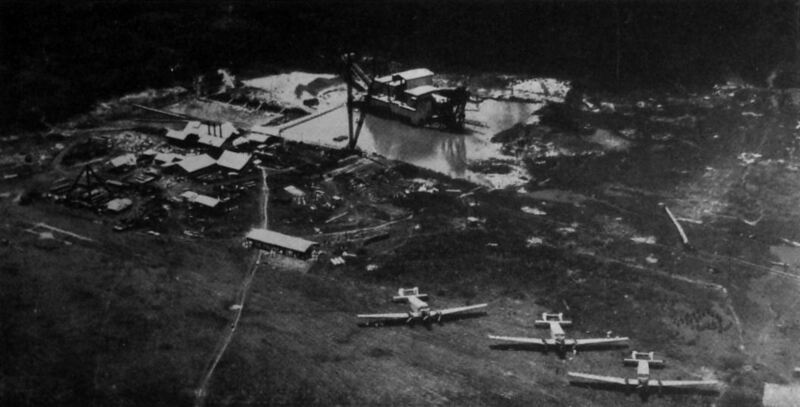 The gold rush: One of the mine landing grounds with the dredge in operation and most of the Guinea Airways' fleet deployed on the field. 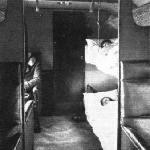 View inside the cabin of the Junkers G.31. 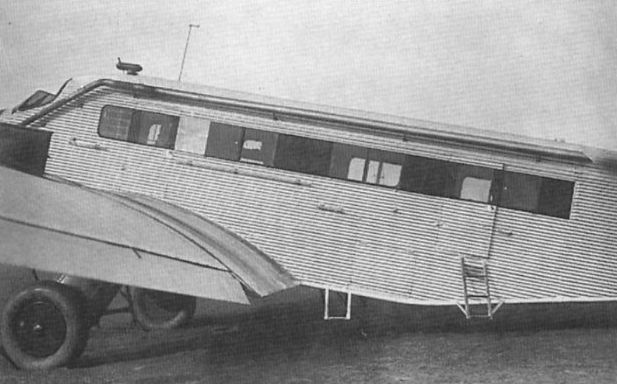 The view shows the forward compartment, with the door leading to the cockpit. 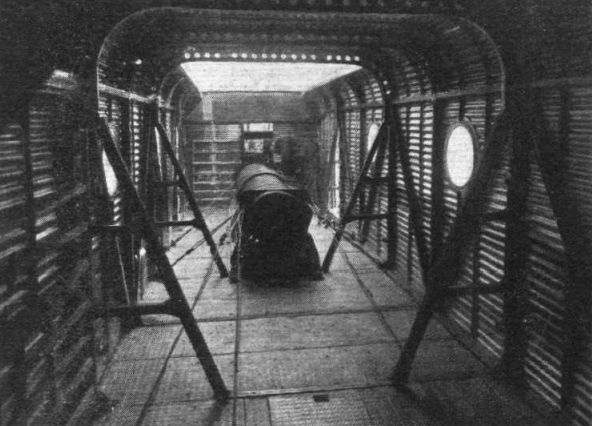 A large luggage compartment is situated in the bottom of the fuselage, under the floor of the saloon. 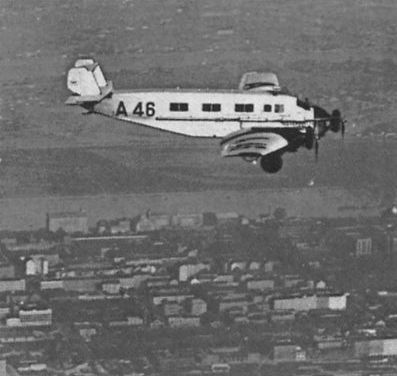 A BRISTOL-ENGINED JUNKERS G.31: The photograph shows a Junkers equipped as a Red Cross machine with eight berths and a chair for the attendant. Presumably, this arrangement might be equally suitable for a night-flying machine. 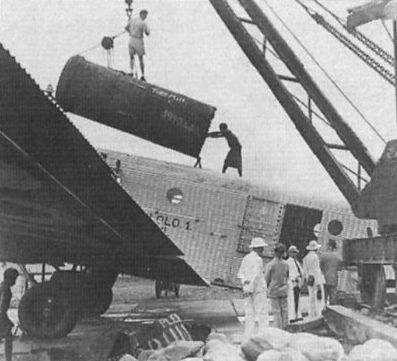 Half a ton or so: This photograph gives an idea of the method used for stowing freight in one of the G.A. 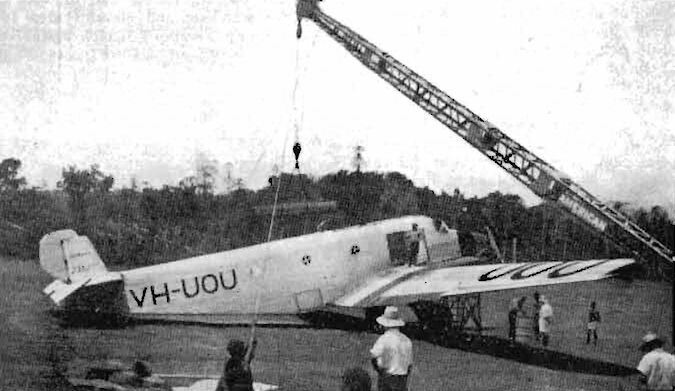 Junkers it is actually being loaded at Lae for transport to the Bulolo goldfields. The size of the loading hatch is noteworthy. 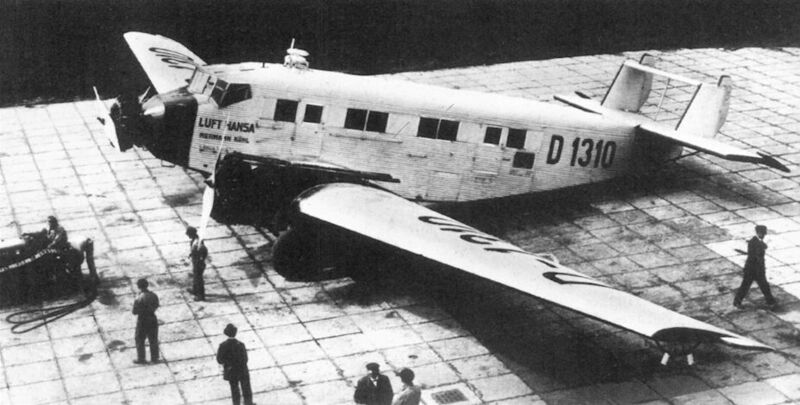 A Luft Hansa Junkers G31, 12-passenger monoplane.